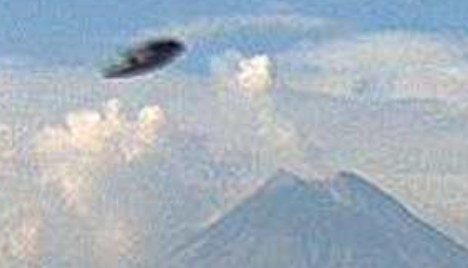 UFO SIGHTINGS DAILY: Mexico: A "Flying Saucer" over Colima's Volcán de Fuego On June 13, 2016, Photos, UFO Sightings Daily. Mexico: A "Flying Saucer" over Colima's Volcán de Fuego On June 13, 2016, Photos, UFO Sightings Daily. This is a really cool sighting from Mexico. I actually saw something like this yesterday on the Colima cam, but didn't report it because it wasn't clear enough, but this one is fantastic. Here you can make out dark disk with a thick center area and a round window or doorway on the edge. Wow, just mind-blowing. 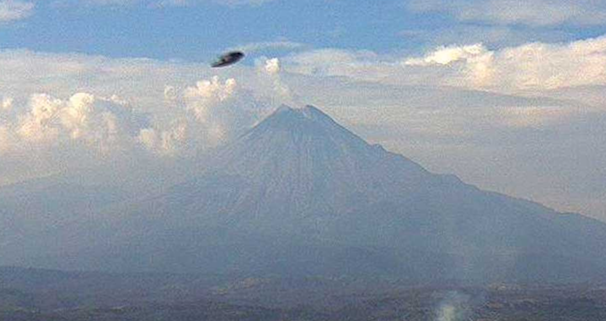 Mexico: A "Flying Saucer" over Colima's Volcán de Fuego Mexico's Criterio Hidalgo (from Pachuca, state of Hidalgo)has reprinted a photograph of an alleged UFO captured by Webcams de Mexico (which has acquired a worldwide reputation for its captures of unusual phenomena over the Popocatepetl Volcano). The text reads as follows: "A new UFO photo has gone viral on social media, shown near the Volcan de Fuego in the state of Colima. Through its Facebook account, Webcams de Mexico displayed the photograph last Friday, showing an object crossing the sky near the fiery colossus. The photo asks the question "what could it be?" in order that users may leave their comments about what appears to be a flying saucers."